I did a lot of research for a new benchtop thickness planer. I knew that the DW735 was very popular, but it was a little expensive, and the size of its footprint didn't work well for me. 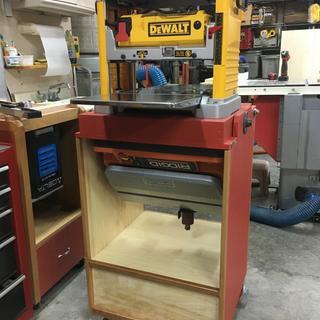 I have a small garage workshop, and I wanted to mount the planer on a swivel top stand along with a Ridgid oscillating/belt sander. I thought about the Ridgid R4331, but read too many negative reviews. Then I found the DW734, which while it doesn't have as many features as the DW735, it had what I wanted: Three knives, a material removal indicator, a locking carriage to reduce snipe, and large infeed and outfeed tables. CPO shipping was extremely fast, and I saved more than $75 compared to buying it at my local big box store when you add in sales tax. I have only used it briefly (to help me build the swivel top stand), but the cut quality is amazing. VERY SMOOTH, and very little snipe on either end. So far, I am very happy. Worked well but found issue yesterday. I am a weekend woodworker, and only about one weekend per month. I have used this planer for several projects which it performed very well. Depth of cut for larger boards should be reduced, but that is common sense- I know others complained of this, but the motor can only handle so much. Yesterday, I was planing some 1x4 fir boards, and noticed the sound change. It seemed like there was extra vibration so I shut it down. When I removed the cover on the main pulley/belt side, I could see the 15/16" nut laying on the base plate and therefore missing from the main pulley. Now I have to figure out how far to tear this down to get it back together, torqued properly, and with some locktite so it does not fall apart again. 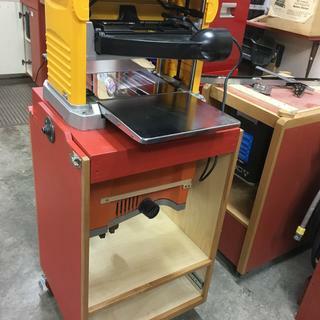 I have had this planer for nearly 3 years now and use it almost daily for my woodworking business. Pros: Portable, smooth 3 knife finish, easy knife flip and change, affordable, Dewalt name and consistent quality, available at Lowes and Home Depot, handles hardwood and softwood well(I consistently run everything from Bloodwood to walnut to purple heart to fir through it). IF you have the extra cash, go ahead and drop the extra $$$ and get the DW735. This planer is decent, but going with the DW735 will be a move you won't regret. Looking back at every project I have ever done, everyone of them would have turned out better with this planer. This planer is an absolute work horse. Right out of the box it planed 200ft of typical Home Depot lumber to protection. Its a new tool at the shop, used a couple of times, Im not sure if I got a nail but it already dented the blade, I think it was a not or hard piece of wood, I got enough power for soft woods but hard wood and using all of it surface it struggles a bit. Wife bought this for me Christmas of 2016. I have literally used it to plane 2 - 2x10 when making a entertainment center, and 8 - 2x6 when making a table all of which were pine. I went to make another table last week and after running 8 more 2x6 through the first time cutting 1/32" the belt broke. It looked like it was only on half way to the pulley. Ordered 2 new belts to have a backup. Put it on Friday night, Sunday the new belt is half way off of the pullies and is melted to them. Call for service questions, get a quote of 217.00 to get it repaired and they no linger have a center here in Austin, have to take it to San Antonio. Is it just me or have I used this planer very little to be having these problems??? Is this a price to pay every 18 months that is half the cost of the planer? I have switched so many tools over to DeWalt over the last 3 years and several of them are the cost of this planer and more, not to mention all of my cordless 20v and 60v stuff. Second guessing myself now. it works good. I can't complain. Yes it does. Works great. This comes with a dust hood. BEST ANSWER: No horse power rating on the motor however this planer is plenty powerful as long as you dont try to take down too much in one pass. Works great. Highly recommend. Plenty of horsepower! I've used this to plane hard maple, black walnut, cherry, Purple Heart and never any issues. This is a solid planer! Are the blades carbide? Listing doesn't say. BEST ANSWER: Not sure, I've had to replace one set, they last for about 1k-2k board feet and then I put the new set in. Depends what material you're using though, I've been using all hard wood and some really dense stuff. No, the blades of the planer is not carbide. The blades are M2 laminated tool steel. Is there a stand foe this? BEST ANSWER: I would assume so i had a table that is working just fine. Are the blades reversible and which is better a 2 or 3 blade? BEST ANSWER: Yes blades are reversible. I would prefer the 3 blade for a better finish on the wood. Also when planing take your time and make sure your lumber is flat on feed table and clear of all nails if using recycled material. Does this planer come with blades? BEST ANSWER: Yes, it comes with blades. It comes with a 3-knife cutter head. Yes, it comes with blades. It comes with a 3-knife cutter head. How thick of material will planer handle ? BEST ANSWER: Max. Material Thickness: 6 in. What is the footprint dimensions of the DW734 Planer? Length, width and Height. BEST ANSWER: The dimensions of the planer are 24 x 17 x 21 inches. BEST ANSWER: The dimensions are 24 x 17 x 21 inches. BEST ANSWER: The blades are reversible and a 3-blade planer is better than a 2-blade planer.